Check out our facebook for pictures and more! Established in 1994, Cinderella Hair had a vision to offer salons and stylists the knowledge and tools to offer a variety of solutions to their clientele from chemical-free color to volume and length. Originally they only offered Organic Bond extensions, however in 2011 they launched their new concept of hair extensions, Our Hair Your Way®. 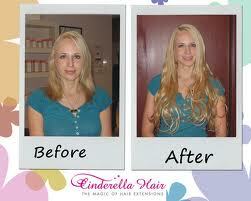 Cinderella expanded their line of extensions by adding I-tip, Tape Extensions, and clip in extensions.